Eden Hazard is one of the best players on the planet at the moment. The way he makes Chelsea tick, with his trickery and distinctive cutting-edge play, is beyond explanation. Chelsea signed Hazard for £30 million from Lille back in 2012. 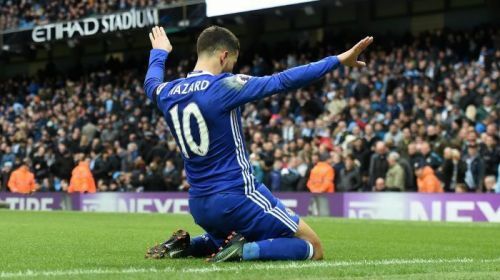 Since his transfer to West London, Hazard has been the star man for them, bailing them out of difficult situations, and winning trophies in the process. His consistent performances have caught the eye of Real Madrid, with speculations all over the media about his potential transfer abroad last summer. However, one cannot blame Eden for wanting to move to Real Madrid, which is regarded as being one of the best clubs in the world. But here are the reasons why I think Eden Hazard should sign a new contract and remain at Chelsea. The Premier League is becoming popular in world football today. Managers like Jose Mourinho, Pep Guardiola, and Jürgen Klopp are all plying their trade in England. If you look at some of the best coaches in world football today, many of them are managers of top teams in the EPL. This means the EPL is competitive enough. So, what would make you as a player switch elsewhere? There is no logic there. In addition, the competition for the title has accelerated, with prior candidates for relegation, Leicester City, even challenging for the title. Chelsea fans love and adore Eden Hazard. The number 10 has become a popular figure at Stamford Bridge, with Chelsea fans all over the world showing love for him. Even in difficult times, the fans still sing Hazard’s name all game long. I think it would be wiser for him to stay at a place where he's adored by everybody. The affection from the fans is not something Hazard can just ignore. Whether he decides to stay or not, he will remain as one of the greatest players to ever wear the blue shirt. This season Chelsea has impressed everyone. Under a new manager, Maurizio Sarri, Chelsea is playing a brand of football which is blowing other teams away: Sarri-ball. A system of play that even Pep Guardiola is scared of, where the ball is moved quickly by constantly pressing the opponent. The beauty about this new system is the amount of freedom given to attacking players. This should be able to benefit Eden Hazard more as he will be able to showcase his individual brilliance. Even after losing the world’s best player, Ronaldo, Real Madrid has a lot of options in the middle of the park. The availability of talents in Gareth Bale, Isco, Modric, and Chelsea’s loaned Kovacic, is not easier to get game time. The emergence of star man Marco Asensio, as the next big talent at Real Madrid, shows you how much stronger this Madrid is. Hazard is talented, but making it into the starting 11 at Real Madrid is not easy at all. Therefore, staying at Chelsea and building his legacy will be asmarter option. The only trophy missing in Hazard’s cabinet is the Champion’s League. Though, Chelsea have won it before. Well, there is no reason why they can’t win it again. However, that will need a lot of investment, especially in the transfer market. After all, Chelsea is never shy of spending in during the summer and winter windows. Chelsea owner, Roman Abramovich, is never afraid to spend on players that would improve the team. We saw that when he spent £50m on Fernando Torres in 2012. With the right players, Chelsea can persuade Hazard to stay at the club. Like I mentioned before, Hazard would struggle to replace Ronaldo’s brilliance at Real Madrid. Therefore, staying at Chelsea and building his name there, is the best option for him. We all saw how James Rodriguez struggled for game time at the Bernabeu despite his brilliant form in the 2014 World Cup. Nevertheless, it is up to the player himself to decide what is good for him and his football career.